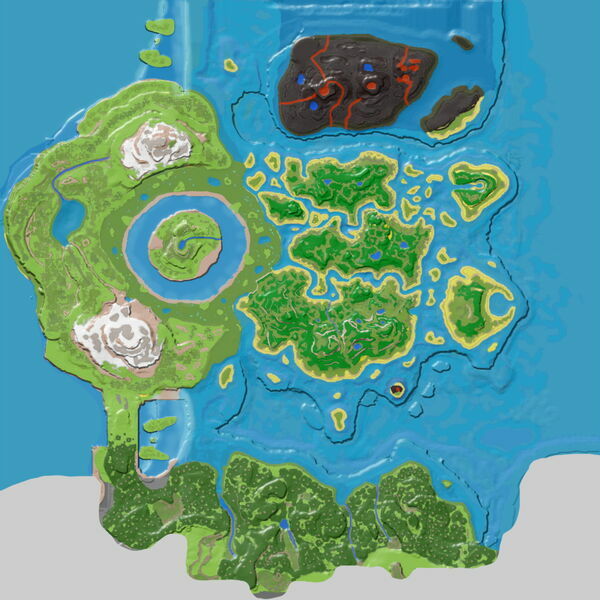 Skull Island, Monster Island, or even more unofficially, Batman Island is a volcanic island in the form of a skull or monster's head to the south in the DLC: The Center. Skull Island is extremely rich in Metal, Obsidian, and Crystal deposits, and while they require mining them over a caldera of lava and quelling the extreme heat, the risk is well worth the riches. Cave-dwelling creatures can be found inside the small cavern and along its rocky shore. If you swim down from the large rocky area to the left of the mouth, there will be no creatures and if you don't run out of oxygen (you'll probably need at least 200 oxygen to get there) you will come across one of the two Underwater Domes, which are big enough to build a base inside. It's very unknown and a great and safe place to build. You can tame a water dino to get there, but note that if the dino enters the bubble it will die and if you enter from too high up you will fall and take damage/die. Although moderately rare, Dung Beetles can spawn here making Skull Island one of the easiest places to tame one. This page was last edited on 3 February 2019, at 15:08.